Luton boss Nathan Jones took full responsibility for the Hatters' 3-1 defeat at Peterborough United this afternoon. The Town chief opted to change formation from the diamond that had served them so well against Portsmouth, Sunderland and West Bromwich Albion, swapping to a 3-5-2 system, with centre halves Matty Pearson, Sonny Bradley and Alan Sheehan all included. However, Jason Cummings scored twice, once from the penalty spot, and Sikiri Dembele also netted to make it 3-0 by the 36th minute. 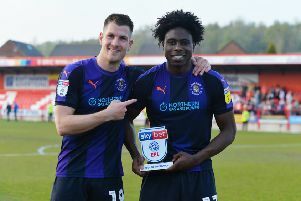 Although Luton improved once switching back to the diamond afterwards, they only had Danny Hylton's late goal to show for their efforts as an honest Jones said: "Firstly, well done to Steve Evans' side in the first half. “I thought tactically they were better than us, they outbattled us, they outworked us in the first half, caught us on counter attacks, which they have obviously prepared for, and a credit to them. "I am very disappointed with the result, I am very disappointed with our first half performance and I will take full responsibility. “Tactically, I thought I got it wrong, I got it totally wrong today. "I should have trusted what we do normally, but I felt a different way we could have really, really caused them problems and it didn't and I accept responsibility for that, but our first half performance wasn't good enough. "The first goal we feel is a foul on the edge of our half, and then they counter on us. We feel that’s a foul, all other times in the game it's a foul. "I reiterate, this isn't sour grapes in any kind of way, we weren't good enough first half, Peterborough were excellent, they countered so, so well and they got their just desserts. "The first one was a definite foul, then we haven't defended well enough, we haven't won our headers, we got done one-v-one in our box, it's too easy. "And then the third one my keeper lies down which he’s doing regularly lately. "As I said, I am accepting full responsibility for the tactical errors I made today, but we still should have come in and been a lot closer to Peterborough, which would have given us a platform in the second half, but too many individual errors."